Bryce had his last clinic of 2010 today and I am pretty jazzed to give an update on how things went. I am a pretty stoked CF mommy at this point. This was Bryce's first clinic where he wore his mask. He did very well with it and wore it almost the whole time. Anytime we left the room he had it on. He wore it our room for a while too. He did much better with it than I expected. He kept saying "Oh nooo." while he had it on. For the past 2 years we have been working towards a goal. For the past 2 years we have been working hard to reach a BMI (Body Mass Index) of 50%. Well...today we finally succeeded in reaching this goal. Bryce weighted 31.2 lbs today. This puts him in the 76 percentile for weight. He was 36.5" in height. This puts him in the 76 percentile for height. Put these numbers together in some sort of formula that I don't care to know since I am far from being a math person and you get your BMI. Bryce's BMI: 54 percent!!! "Mr. Perfect" and "Rock Star". Today our fabulous Pulmonary nurse said that Bryce has come such a long way from our first meeting. She told me that when she and Dr. P (GI doc) first saw Bryce, they were both very worried because of how scrawny he was. It was nice to see our pulm nurse just as excited today as I was. I love knowing he has such an incredible group of people in his corner. For the first time in Bryce's clinic visit history he finally got a check mark next to the GREEN traffic light on his Cystic Fibrosis Care Plan sheet. He has constantly been on YELLOW, but today we got the GREEN. Oh happy day! Don't you love our GI doc's comments about potty training. She said that boys are much harder to potty train than girls. We start this weekend. Eek! Bryce's care plan and progress chart since birth. Now the trick is to keep him on this path. I think it's definitely doable. Bryce has been on a good schedule of things lately and is eating really well. Actually over the past week his appetite has really picked up. I'm so proud of Bryce. I am so proud of how he just rolls with all the extras he has in his life. I know he doesn't know any different, but I'm just proud of him. Just to show you where we started. 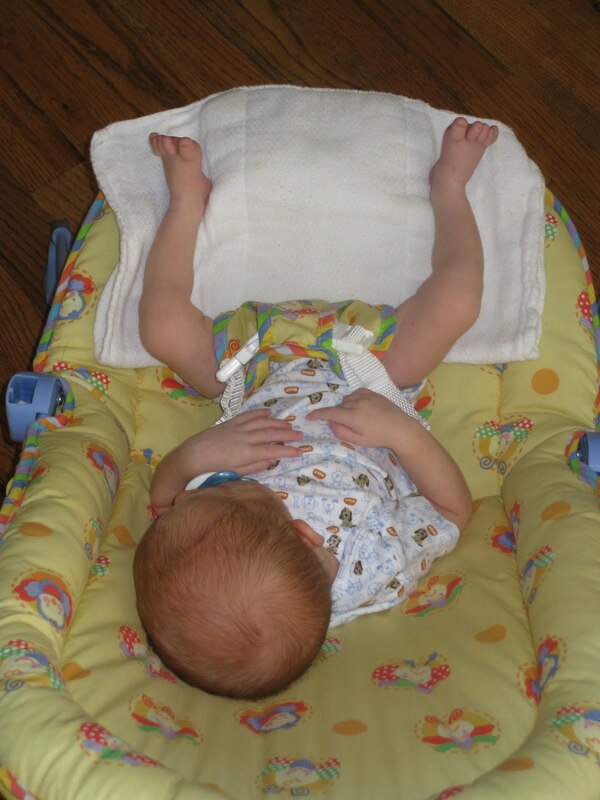 Here is a picture of Bryce's legs when he was an infant. The picture actually makes him look thicker than he was. He was so skinny! Here is a picture of his legs now. Two years of hard work and constant fretting over his calorie intake went into those chunky legs! Nothing is changing with Bryce's care. His lungs are clear so we just keep up his vest like we've been doing. He does 30 mins, 2 times a day. I bumped him up from 60% to 80% "intensity", but was told today that it's not necessary to have him at such a high percentage. Since the 60% is working for him that's where we will stay. We are to start him on the Albuterol only if a persistent cough starts. We haven't had much use for the Albuterol in the past year so that is a great thing. Currently in the mornings B is really congested. The snot that has collected while he sleeps is really think and hard for him to move just by blowing his nose so we started doing nasal rinses. We call it "getting the boogers" out. Bryce is doing really well with the rinses. I highly recommend the nasal rinse if you aren't doing them. They are working wonders. We do the rinse in the morning and he is clear for the rest of the day. We are to start giving him Flonase after the nasal rinse to keep him nice and clear. Woody's lungs sound nice and clear too! Eating chicken nuggets and watching Mickey Mouse Clubhouse while we wait. We will continue doing what we have been doing with Bryce's daily care. His next clinic will be February 17th. Please continue to lift Bryce up in prayer...let's keep this weight gain and healthy momentum going! This is awesome! I am so proud of the person you have become, not that you weren't always great! I am very excited for you and your family... what a great day! Hip Hip Hooray!!! Great news! Wow! Congrats to you and Bryce!!! We know how aggrevating weight gain can be! I don't think you can ask for much more- a healthy, and plump ;) little boy... GO BRYCE! We are all very excited for you...let's hope Madeline's quarterly check-up in early Dec. can be as good! Such fantastic news!! I'm so so pleased for you all. Way to go. How cute does he look in his mask!? We don't use them here in the UK I think Sophie would go mental if we tried to put one on her!! Again, really really fantastic report. Awesome news Jenny!! It's so nice when clinic visits go well. Congrats on the weight!! I know that must be a huge load off your shoulders. We didn't start a bronchodilator (Xopenex) until later either. Our Pulm said that research doesn't show that it helps much when started right away. We are only on it now because he was having bronchospasm during Tobi. Keep up the good work Mama! !